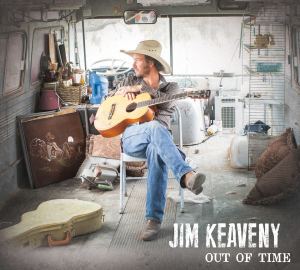 Often described as a country singer Jim Keaveny must be quite uncomfortable to be labelled with such limited imagination. That is not to say there is no country in his music, there is and plenty of it, but with more than hints of blues, hillbilly, classic country, a little Tex-Mex, folk and more besides, perhaps even edging into the over used singer songwriter category. In my world ‘singer songwriter’ tends to cover anyone who sings and writes their own songs and spreads from ‘pop’ into anything that is of indeterminate genre. In other words a ‘cop out!’ Certainly Jim is a tremendous songwriter and is just as good a singer, in fact reminding me of a more melodic (and younger!) Bob Dylan, (or even Joe Strummer! )but Jim has a much more fluid style that covers many of the various sub genres within the roots music field. His style is predominately rooted in an edgy country field but with his own slant on the tradition showing he is a man who is determined to follow his own route wherever it takes him. If his muse strays into other areas so much the better, and yet after very few plays of this tremendous album and despite the diversity the listener soon realizes that Jims style will stay with them and will be easy to pick out from the crowd. Hopefully this will give him an excellent chance of the success that a man with his talents so richly deserves. This is his fifth album release and is full of melodic guitar sounds, with quite a strong accordion prescence that helps provide a warm atmosphere. The emotive harmonies do nothing to remove the excellent and hugely appealing raw edginess that is thanks in the main to his vocals that provide an excellent counterpoint to the melodic blend of instruments whilst still enhancing the melodicism. All fourteen songs are written by Jim Keaveny with the exception of a couple of co writes with Ethan Millang and Mike J. Dwyer. Jim takes all lead vocals plays guitar, harmonica and percussion, with his wife Anna Oakley adding fiddle and backing vocals, Bill Palmer plays electric bass but on the track where upright bass is used that is courtesy of Noah Martinez and the sometimes dominant and beautifully flowing accordion is played by David Barclay Gomez. Whilst the blend of instruments are not of themselves unusual, at times the overall arrangements have a strong and hugely appealing originality. Perhaps the albums unusual feel is due to the impression that the character in the songs has a rural background and is at home in the dusty south western areas of the U.S. as well as an occasional visitor to the urban areas further north. Certainly those feelings create a very strong identity for Jim and this tremendous album that despite it’s lightness of touch also has a nice depth that further enhances the atmosphere. The album opener is Eugene To Yuma, a song first heard, although in a different and more raw style, on his 2003 album ‘These Old Things.’ This time it is a terrific easy going mid tempo country folk song with excellent bass and percussion laying the foundations, and harmonica and melodic chiming guitar helping the song along with the atmospheric intervention of a gorgeous accordion on a roaming story song. On I Found A Girl there is a nice twangy guitar intro accompanied by a lovely flowing accordion sound and more twangy electric guitar supporting Jims vocal on a tale of someone returning home and wondering what sort of reception he will get, although the song is never over dramatic and includes angelic harmonies on the chorus. Out Of Sight is a song that has a strong Tex Mex feel with the accordion and guitar sound adding a sense of drama to an excellent rolling, melodic tale about moving on both figuratively and literally. Out Of Time starts with a driving bass, percussion and vocal reminiscent of the Clash! It certainly doesn’t have a particular country or folk sound, but the mariachi horns drag the song to the south west rather than the Appalachians and whilst it rocks with the powerful incessant bass it is also not really a rock song. Perhaps all of those threads plus a few more besides! Someone To Talk To Blues with its powerful bass and percussion has an excellent, almost funky feel aided by melodic electric guitar and Jims straining vocal on a song that could have (but didn’t!) come from a Steely Dan recording, even having a little bluesiness to further change the albums texture and keep the listener guessing. The album concludes with the slow moody ballad The Yippee-i-ay Song, a gorgeous and evocative tale on which we hear acoustic guitar, fiddle and accordion solos on a song that has a nice sense of light drama with an anthemic chorus. I never seem to stray far from Dylan comparisons on this excellent album but it is only by way of some of Jims vocal characteristics and I am probably over playing that! In every way he is a quite original artist who ploughs his own musical furrow and long may he continue to do so if it means producing albums of such supreme quality as this and his previous work.